Walking into the exhibit, these two New York-raised reporters didn’t see a burning building; they didn’t hear the blaring sirens; they didn’t smell the melting tar. 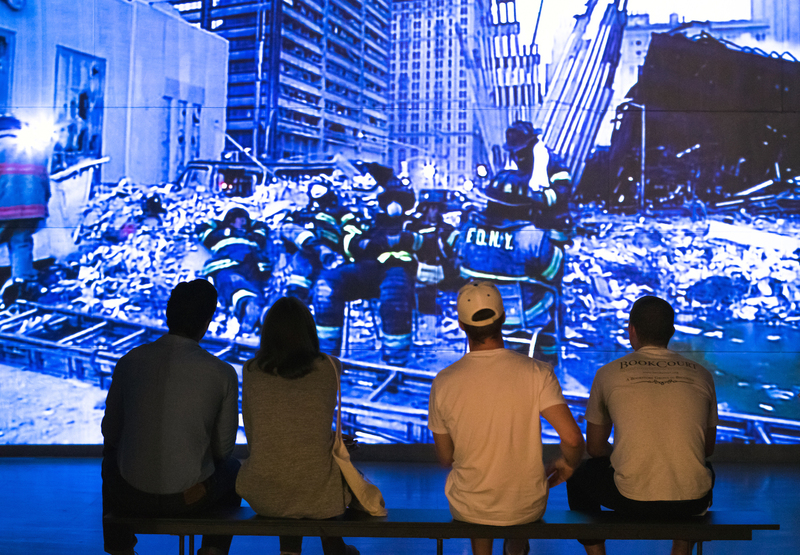 Instead, they witnessed and participated in an attempt to comprehend the collective memory of the Sept. 11, 2001 attacks on New York City’s World Trade Center. On the evening of Tuesday, Sept. 13, “here is new york” made its Connecticut premiere at the Ezra and Cecile Zilkha Gallery at the University. The opening of the exhibition was accompanied by an emotionally provocative Q&A discussion between President Michael Roth and world-renowned photographer, educator, author, and pioneer of the project Charles Traub. 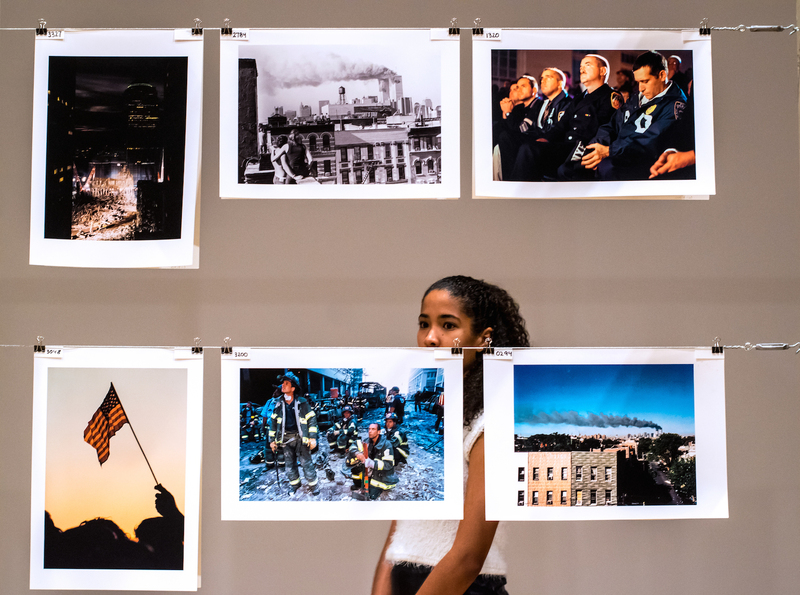 “here is new york,” a photographic project created in response to the 9/11 attacks, originated as a means for anonymous bystanders to have voices and share their stories beyond conventional networks of reportage. In 2014, 13 years after the beginning of the project, 273 of the photographs were given to the Davison Art Center by Traub and his son Aaron through the School of Visual Arts (SVA) Archives/ Visual Arts Foundation. The collection was dedicated in honor of SVA’s current president, David Rhodes. Traub began the talk by welcoming “here is new york” to Wesleyan and explaining how the project came together. The list of those who worked tirelessly to set up and hang the show includes Clare Rogan, curator of Davison Arts Center and custodian of the images; Aiden Earle, gallery supervisor; Rosemary Lennox, program manager; and student volunteers. Traub thanked photographer Abigail Feldman for helping design the “here is new york” exhibition. Roth started the conversation by asking the Louisville-raised artist about his early life and career. Traub, an English major from the University of Illinois, went into great detail. Throughout the conversation, Traub emphasized his personal discovery of the significance of photography as a mingling between both artistic and journalistic expression, and not just as a means of delivering one or the other. He stressed that during the 1970s, the medium was a growing phenomenon around the country and world. “Here is a form of expression which frankly served me and was beginning to serve a generation better than other forms…Here’s something I can put my soul into in a different way,” Traub said of the origins of his passion. After discussing Traub’s own history, Roth began to lead the conversation to the history of the exhibition. Traub emphasized that this was not an independent project. He was accompanied by Michael Shulan, Gio Perez, and Alice Rose George. 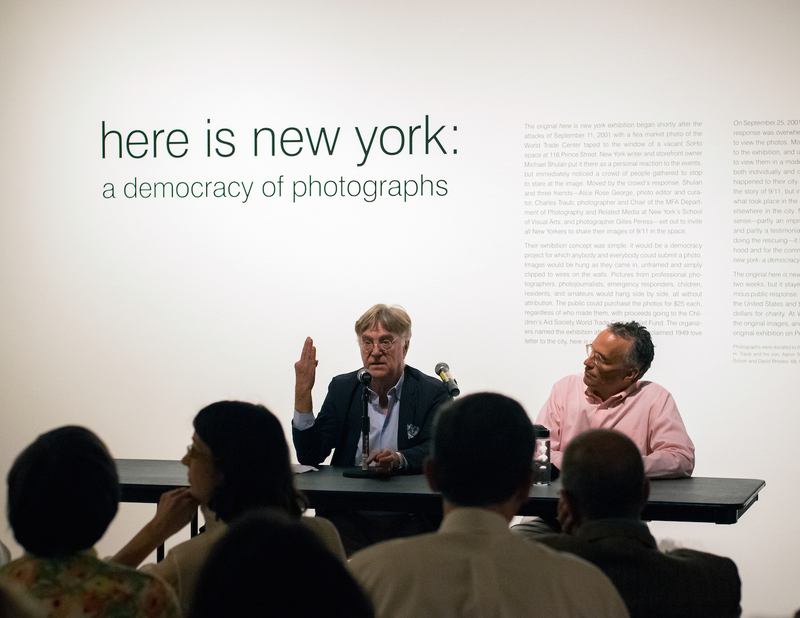 Traub recalled the original location that housed the photographs from the first “here is new york” exhibition. Perez insisted on the name “here is new york,” which refers to the 1949 E.B. White short story describing the possibility of a plane hitting a building in post-World War II New York. Traub explained how the founders set a sign up outside the storefront, encouraging any passersby to contribute. The principal founders of the project all agreed that no artist names be attributed to the images and that each photograph be identical in size. 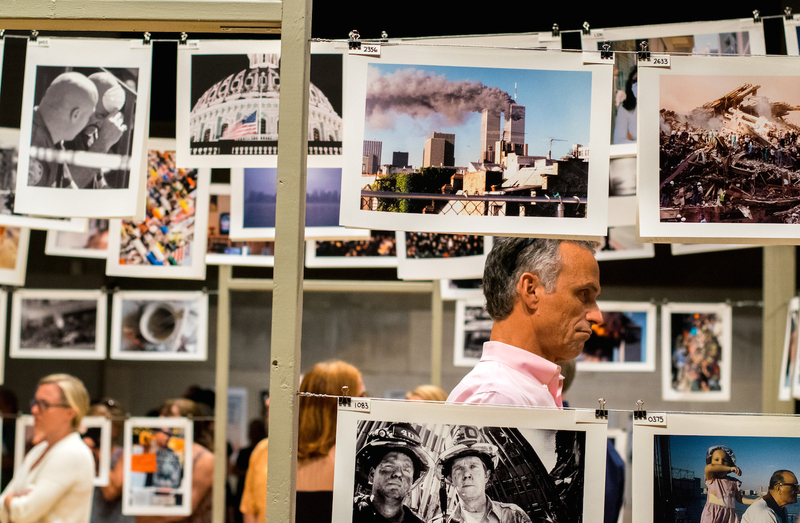 Though intended as a volunteer project, due to financial necessities, Traub and the team of 250 volunteers decided they had to sell the photographs at $40 a piece. The majority of the proceeds—$1 million—were donated to the Children’s Aid Society, and the rest went toward gallery rent, paper, computers, and the hiring of a full-time staff. The show took off, traveling to over 50 different locations and becoming the most viewed exhibition of its time. 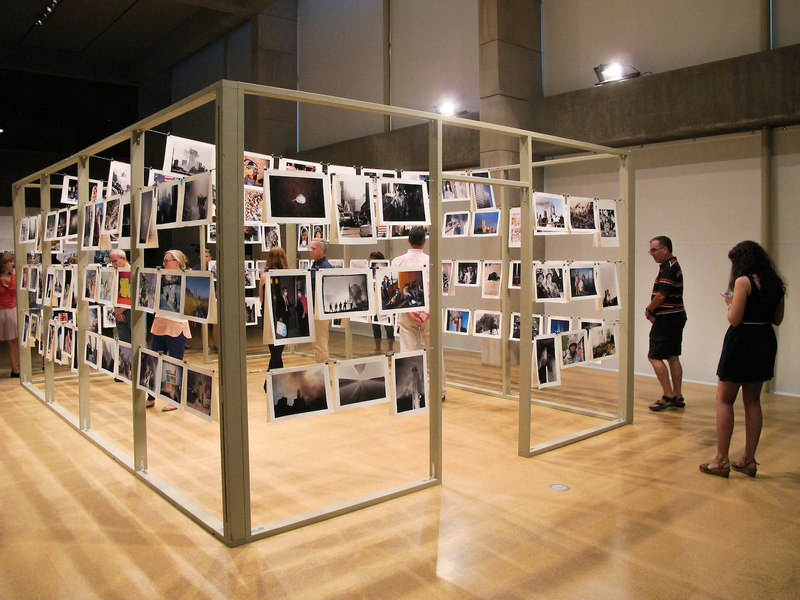 The space for “here is new york” in the Zilkha Gallery was created with the intention of placing a gallery within a gallery. Aided by student volunteers, the creative team at the Davison Art Center designed the space to replicate the feeling of entering Shulan’s original storefront. Overwhelmed by often painful compositions situated in the cramped space, one’s head is forced to arch backwards, forwards, left, and right to look. However, the wall-less structure provides openings that allow viewers to witness others experiencing the images, creating a sense of solidarity. Lily Landau ’18 offered her thoughts as she walked around the images layered throughout the makeshift storefront. Charlotte Pitts ’18, who helped set up the exhibition, noted the way Earle intentionally distributed and hung the images among one another. Roth shifted the conversation toward Traub’s thoughts on the impact of the project on those that lost loved ones during the attacks. Traub continued, making clear his opinions of the War on Terror and why the project still resonates 15 years later. Toward the end of the discussion, Roth began to reflect on the concept of remembering 9/11. Roth emphasized his desire for respectful distance when commemorating the event. Often when we enter a memorial that pays tribute to tragedy, we’re asked to enter a time machine. We’re asked to step back and feel, to empathize. “here is new york” upends this notion and resists the temptation to sensationalize. The exhibition offers us the opportunity to consider forgetting an event that has caused permanent pain and has largely shaped today’s American landscape. The exhibit will remain open to the public until Oct. 9, 2016.